Custom imprint Plastic Tokens, Wooden Nickels, Full Color Plastic Tokens, Molded / Embossed Tokens, Transparent Tokens, or Metal Tokens with your design and copy. Use one of our 300+ stock designs for your plastic tokens, wooden nickels, and metal coins, or use your own. You can choose from a variety of token colors, imprint colors, and sizes. Delivery time is two to three weeks for all types of plastic tokens. Wooden nickels are delivered in a week to ten days. Metal Tokens take about four weeks. Quick print/delivery is available for all our tokens. The minimum order is 500 for regular plastic tokens (one-color imprint), 1,000 for wooden nickels, 250 for wooden dollars, and 250 for metal tokens. Volume discounts are available. Our one-color plastic tokens, wooden nickels, and metal coins are made in the USA. You can use plastic tokens, wooden nickels, and metal coins as bar drink tokens, pizzeria tokens, coffeehouse chips, restaurant tokens, jacket and hat checks, meal and ride tokens, admission tokens, and much more. 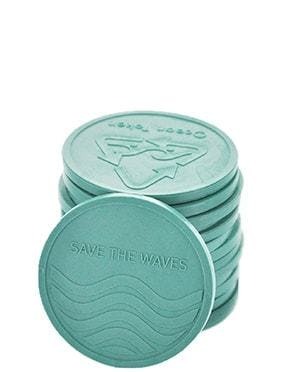 Plastic tokens, wooden nickels, and metal tokens make great promotional tools for any organization, including bars, lounges, restaurants, clubs, retail stores, conventions, fairs, and shopping centers.